Alright, well I believe that somewhat that falls under his selfish side, the same side that wanted nothing more to do with Vietnam than to save Tom but in a different way. Personally I am not sure what instances in this particular episode in which you see this occurring (but then again it's an ungodly hour in my agenda, since I have class today, one in which my noggin isn't in the best working condition) but I see your basic point and agree. Some of that in part however can be blamed on Al himself. Perhaps if he wouldn't at times show up on his own agenda or share his unmoral opinions with a man whom he should know better will argue them (Ex. Thou Shalt Not) Sam might take him more seriously in some instances. Not that I mean to defend Sam; I can see where you are correct on this point and agree with the frustration of his such behavior in some episodes such as All Americans and as you pointed out The Leap Home(though given the personal circumstances of that leap you can't completely blame him). I however will not yield that it is a necessary flaw. To show a selfish and/or conceded side of such a pure and compassionate man provides a good believable balance to what would otherwise be too perfect a character. It happened sometimes that he was so focused on doing the "right" and the "moral" thing that he immediately discarded any comments or visions from Al, even if they were for the better. This is an interesting point and of course what's "right" and the "moral" thing to do isn't always black and white, and what's the right thing to do in one situation is not necessarily the right thing in another. Further upthread Trudy commented that Harry and Jamie seemed happy with their life and that she would have liked to see an outcome with Harry continuing as a good single father who loves his daughter and raises her himself. I agree with this. I really didn't like too much that Sam feels that the only way they can be happy is to reunite them back into a traditional nuclear family. While sometimes this is the best situation, a lot of times it isn't. Also, and I don't know exactly why, but he gave me the impression that sometimes he kept judging Al for his past, for the way he lived it. The comment on his mother stems away from this self-centeredness and from his (mistaken) notion that he had the word on what was best for the life of everybody. Here is where Sam's self-righteousness comes in. This is an example of it and he was definitely judging Al. Al spent the majority of his childhood years in an orphanage most of the time but from some of the stories he tells on the street sometimes too, because of the actions of his parents, particularly his mother. We know what the fallout was for his sister Trudy too. Now, to be fair, we know the story of his mother as Al tells it, and it may not be accurate -- maybe his father bad-mouthed his mother to Al and Al believed it because he had to, because his father was the one he was left with. For all we know his mother had a very good reason for leaving, like maybe it was a matter of her survival, which Al may not be aware of or doesn't want to admit. But from his perspective and as far as we know his mother callously ran off with another man and abandoned the family. And things continually got worse. Is it fair for Al to now judge every woman/every mother by that? Nope. But it's human nature to react to things based on our experiences. And whatever her reason Maggie did walk out on the family. The Becketts weren't perfect and everyone has their problems but Sam grew up in a relatively happy and loving home, he has no idea what it's like to be abandoned by a parent or to wind up parentless or on the street. It's really easy to judge someone in a situation when you're looking at it from the outside and you've never experienced it. Which is what Sam is doing when he makes the comment about Al's mother and why it ticks me off. Further upthread Trudy commented that Harry and Jamie seemed happy with their life and that she would have liked to see an outcome with Harry continuing as a good single father who loves his daughter and raises her himself. Agreed that the outcome with the parents getting back together was not believable. No separated couple gets back together especially not when one up and leaves because they couldn't handle your life anymore. Despite that Sam had pushed that in the end since it wasn't in the original outcome, either way the mother still remained in the equation having won her daughter's acceptance back. Which in the time it was forced to take since they only have a hour to tell the story, also wasn't realistic. Especially not as angry as Jamie rightfully was. Harry having won sole custody would have been a very unique and refreshing outcome. Though again probably not realistic for the time period and given his circumstances. I really didn't like too much that Sam feels that the only way they can be happy is to reunite them back into a traditional nuclear family. Who said he reunited the parents because he felt it was the only positive outcome? What was portrayed with that angle was that Sam saw these in these two people that there was still love between them and thus felt that they were throwing their relationship away for no good reason. Agreed that Al could very well be romanticizing his father. Even if he were abusive let's say, the way Al might see it is that he was there and tried at least for a little while. Or he doesn't give the father credit but the mother could have been more of the villain in the same scenario because she left him and Trudy in that environment, with a violent man. How could she be so selfish!? Or perhaps the mother left because the father was unfaithful but the children were never told of this so to Al it can have no other appearance than that the mother just up and left. Once again the father would be romanticized in this scenario, a victim. 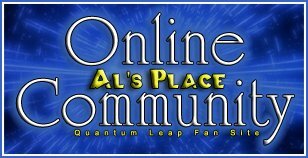 My best friend whom in her Quantum Leap writing likes to work more with Al than Sam (and has a pretty amazing handle on his character) wrote a piece set in Al's childhood where it's mentioned that he told his peers his mother was killed in a car crash because he was too ashamed to admit that she'd abandoned the family. She also wrote another where an adult Al who had always kept that he was an orphan to himself (even in the childhood piece he never mentioned the orphanage to his school friends) and would fabricate where needed opens up about it to Beth. Sam is the one person Al trusts more than he's ever trusted anyone in his life; so since he tells Sam that the mother left she probably did regardless of the reason. If any part of what he actually tells is untruthful it's because either he has the wrong idea about the mother's leaving or the he romanticizes his father who wasn't as caring or as much of a victim as he implies. This is perfectly explained. Why I didn't think of it this way is beyond me. As I pointed out earlier, Sam and Al are exact opposites in practically every way. Sam being a very compassionate guy always feels for the situations of others but is only human and by no control of his own can not relate to everything. He has no notion of what it's like growing up in a negative environment as in turn there are times when Al forgets that Sam was raised in a loving home. Such as in Leaping in Without a Net. "Let me guess, you ran away from the orphanage when you were a kid and joined the circus?" Sometimes I do feel like Sam doesn't try as hard to sympathize with Al as he does with the people he's involved with in leaps. Why, I can't imagine. Agreed that the outcome with the parents getting back together was not believable. No separated couple gets back together. Although Sam had pushed that in the end since as Al put it that wasn't in the cards in the original outcome, the mother still won her daughter's acceptance back which in the time it was forced to take since they only have a hour to tell the story, also wasn't realistic. Especially not as angry as Jamie was. This is my take on it. Sometimes a separated couple can get back together but given all the anger here it didn't make sense for this couple, and certainly not as quickly as it did. I agree that this may have been part of it as Sam tends to be a romantic that way. But he can get a little too gung-ho about the romantic aspect. There is a lot of anger here and this family has problems. It was too pat. I also think that because Sam comes from a more traditionally structured family he does a little bit overlay this idea onto other situations though. Agreed that Al could very well be romanticizing his father. Even if he were abusive let's say, the way Al might see it is that he was there and tried at least for a little while. Or he doesn't give the father credit but the mother could have been more of the villain in the same scenario because she left him and Trudy in that environment, with a violent man. How could she be so selfish!? Exactly. He may have witnessed his father abuse his mother and even blocked it out. That's a terribly traumatic thing for a child to see. I never got the sense that Al was abused by his father, but again, maybe he blocked it out. Or he might blame his mother more for leaving him at his mercy. I think Al's either joking with Sam when he says, "Didn't you?" or he's leading up to his comparison, almost in a bragging way for lack of a better word. Because he goes on to compare their upbringing, which shows that he didn't forget at all. I don't think he ever forgets that difference between them. "Oh sure, you grew up on a farm, I grew up in an orphanage. You had a mother and father, I had a parole officer. You had a cow, I had a roach." I'm paraphrasing, as I don't remember the exact dialogue right now. But I actually love this exchange. It's hilarious when Al starts talking about Kevin the roach. True this is also a possibility, however since this is information that is never developed there is nothing to suggest that what we are told isn't true. You're probably right. Forget I said anything regarding that subject. It's one of the funniest exchanges in the series for me. It's really done well and Sam's expression while Al is talking is priceless.